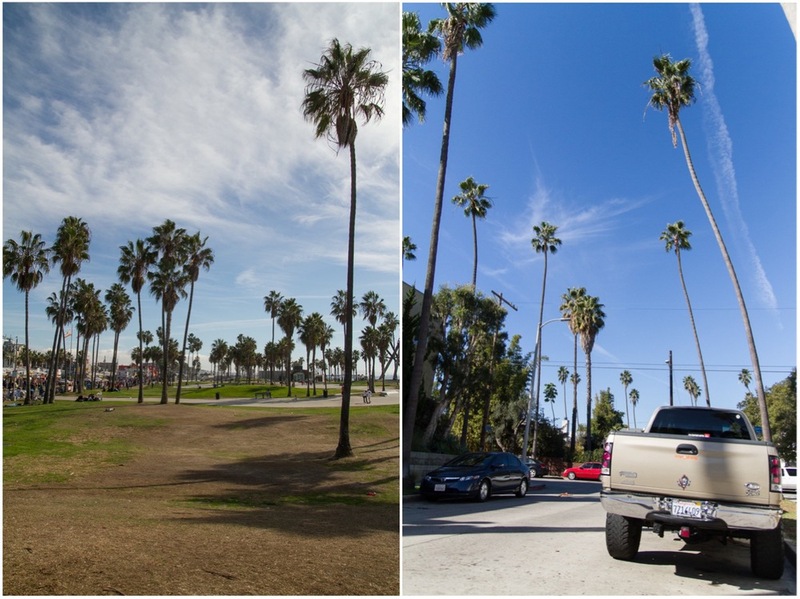 We rented a car in San Francisco and drove to LA. Although many people recommended we take the coastal highway for the views, we chose the 101 because we wanted the drive to be over with sooner. We have to confess to something: we did stop on the way in Cupertino to see the headquarters of Apple. They were absolutely… normal. Lots of young people walking around with laptops and iPhones. In hindsight, not worth the detour. But hey, we were there! Towards the end of our drive, we stopped in Santa Barbara for coffee at the French Press. Santa Barbara is a nice town where many people move to retire and we don’t blame them: it is a nice, cosy town with the atmosphere of a high-end beach resort. The coffee at the French Press was surprisingly good, though. We also stopped to refuel and found that the fuel for the whole six-hour trip from San Francisco to Santa Barbara cost us… 37 dollars! Gotta love those US gas prices. Some 40 minutes later, we were in our destination: Camarillo. Camarillo is a fairly small town along the main highway that is famous for its agriculture: 50 feet of top soil and four growing seasons a year never ceased to fascinate us. The other notable thing about Camarillo is it outlet retail centre where many people from near and far travel for the best fashion bargains. We stayed in a small casita (a garden house) of Suzanne and Kevin, a retired couple with whom we exchanged houses: they stayed in our rental apartment in Prague in April and we were really happy to see them again. We then took our car to drive to LA and back every day. The trip took about an hour or slightly more, depending on the traffic. This might seem crazy in the Czech Republic, but a long commute seems to be a fairly normal thing in central California. Los Angeles was arguably the most American city of all of the cities we visited during our US trip, namely because it was the only city that was not in the slightest walkable: if you don’t have a car in LA, you don’t exist. Also, we will never, ever complain again about traffic in Prague. You don’t know what traffic is until you get stuck on a inner-city highway with seven lanes in each direction. That said, we liked LA a lot. The weather helped. We now understand Californians when they say they miss the weather. Oh yeah. We stayed in the LA area for a week only, and we miss the weather already, too. It is really hard to argue with sunny days and temperatures of about 25C/75F. In late November. We had to pinch ourselves because we could not believe it. LA is a place where people walk in shorts and flip-flops in the courtyard of a mall, listen to Christmas carols and someone shoots artificial snow on them from the first floor. Also, LA was probably the largest town we have ever visited. It really feels like a lot of smaller towns bolted into a single big city. Nowhere else will your GPS navigation say “after 35 miles, keep left”, and you’re still in the same city. We learnt that planning your route is crucial: if you put just restaurants and cafes you want to visit in a list without thinking about their precise progression and location of each place, you may - and will - end up driving the whole day. Trust us this one - we learnt the hard way. We started our first day in LA with a visit to the Proof Bakery that serves nice sandwiches and sweet baked products. We had the almond croissant and it was… the best croissant we had in the US. Talk about a good start. After that, we took our car to Sunset Boulevard to see some shops and had coffee at Intelligentsia. You know the feeling when you order something, it costs more than you thought but you feel too embarrassed to say something and just go ahead and pay it? That’s exactly what happened to us with the USD 6 single-origin cappuccino at Intelligentsia on Sunset Blvd. But the coffee was good and the place was clearly very popular. Nice tiled design, too. After some more shopping (the shops on Sunset Blv are really great, btw), we went to look for Ricky’s Fish Tacos, the mythical food truck was recommended to us by several of our guests. A bit harder to find when parked in a tiny driveway. The menu? Just fish and shrimp tacos. We had one each and honestly liked them, but would we travel all across the town to have seconds? We’re sorry, LA foodies, but probably not. Still, it’s a great and unique place when you are in the area. After the tacos, we had a long walk along the Sunset Blv (you can see the Hollywood sign from there, too), went into some more shops and then - guess what - drove again to an area near the downtown. We visited a shop/gallery where a young man selling glasses in a pop-up shop confessed he was cold (it was 18C/65F) and then had a look at The Pie Hole- a small cafe that sells savory and sweet pies made in house. Looked great but we did not have any because we had a reservation due 15 minutes later at Bestia. Bestia is a lively and a fairly large place that serves Italian-inspired dishes. The great atmosphere and a DJ lure in various types from glamorous to the more casual. Something like SaSaZu in Prague but with Italian food. The kitchen and the waiting staff work in perfect harmony. We ordered several smaller dishes to share and liked most of them, notably the chicken liver toast or the beef tongue with lentils. The only letdown was the last dish: simple spinach gnocchi with bone marrow - it was too rich and too fatty (and that’s saying something, coming from the two of us - we love bone marrow). All in all, this was a place easy to admire: it is a factory but it is a well-oiled machine, too. The next day we slept in a bit. The nights in Camarillo actually got fairly cold but the bed in the casita had an electric circuit that warmed it from the inside. We absolutely adored this and we think that we might be getting this for Christmas! In any case, we drove downtown to the Grand Central Market, a large indoors market open into the streets on both sides that is clearly very popular among people from the nearby offices and others. It was not a posh place like some of the inner markets can be, but instead catered to diners of all social backgrounds. The best place in the market was Eggslut. Yes, a truly horrible name, but oh-so-delicious egg sandwiches! There tends to be a long line waiting but the wait is worth it. You can watch the inked staff and listed to hard-core rap blasting from the loudspeakers in the meantime. We had the Fairfax in a biscuit: soft-scrambled eggs with bacon, avocado and Sriracha mayo, all in a wonderful, fluffy biscuit. Our heaven. It was so good we went one more time: they ran out of biscuits but the brioche bread was good, too. There were other popular stands in the Grand Central Market, but Eggslut was the most popular of them all, and for good reason. We then drove to the Larchmont area. In the best of our traveling traditions, we got pulled over by the police and nearly paid a fine: we changed lanes where it was not allowed… straight in front of a police car. After many explanations and many “yes, sirs” and “no, sirs”, the policeman looked at Jan’s ID card and said: “Czech Republic… Welcome to LA. But you still got to drive right, ok?” And we were off. A close one. We parked at Larchmont Avenue and went for coffee to Go Get’Em Tiger. This was one of our favorite cafes in town. They are not limited to a single supplier of coffee but offer a nice variety of beans. Our barista patiently explained their sized and we got just the type of coffee we wanted, and it was prepared very well. Nice outdoor seating, too. After the coffee, it was time for ice-cream, which we had at the Salt and Straw shop nearby. Just like in Portland, Oregon, it was delicious. We then walked along the W 3rd Street and Beverly Blvd and visited shops on the way. One of them was the Monsieur Marcel market near the Grove mall, a small market with various vendors selling fruits, vegetables and cooked dishes. Looked very popular. We then continued on Melrose Avenue and stared at the high-end fashion stores lined one next to each other. The other great shopping street was Beverly Blvd: we finally got to buy some Heath Ceramics plates there, and had salted caramel and rosemary ice-cream at Rose Creamery a few blocks away. But by then it was time for dinner. We had first coffee at Alfred Coffee [In The Alley], the trendiest cafe in Los Angeles by far. Their black-and-white tile decor is striking and fun and the whole room looks like a one big optical-illusion joke. We were served coffee by Stumptown but the preparation was less then ideal. Still, you have to like a well-designed cafe like this one! After the coffee, we finally had dinner at Ink. You see, we have a confession to make: we absolutely love Top Chef. So we knew straight away that we would visit the restaurant of Mike Voltaggio, the winner of one of the seasons. The restaurant is located on Melrose Ave among high end boutiques and the diners seem to fit in. We did like the food: it was creative and packed great flavors. What we liked less was the pace of the dinner: while many restaurants in the US seemed to push the dishes just to clear the table, ink was the most rushed dining experience of our entire trip. That said, it was the most creative dinner we had during our stay in LA. The next day, we decided to visit Venice. We went to Huckleberry for breakfast but it was packed so we drove to the nearby Superba Food and Bread instead. We absolutely fell in love with this place. We liked everything: the open kitchen and bakery, the communal tables in the remodeled industrial hall, the counter with wonderful pastries, the food (Shakshuka, porridge with fruits and a burata toast), and so much more. We could have spent hours there in the company of our “soon-to-be-a-movie-star” waiter. Superba is a beautiful establishment that bakes its own bread and puts you at ease with the relaxed atmosphere. Another place nearby, Gjusta bakery, had a very similar concept and appearance. These great breakfast places is something Prague needs more of. After breakfast, we walked around a bit. We visited Deus Ex Machina, arguably the coolest cafe in LA, nestled comfortably inside a place that is half custom motor bike manufacturer and half motorbike-inspired fashion and accessories shop. They have a few communal tables and two leather couches where you can drink coffee and read some of the magazines and books they have in their small library. We would have loved to stay, but the coffee did not look that great so we went to Intelligentsia instead. The Venice location is really nice, though: lots of light inside with the centrally located bar and stools on the sides. The outdoor seating is nice, too: in a shade yet outside along the street. The coffee was nice. We then did some shopping and visited the Venice beach. It was exactly as we imagined it: nice but super busy. The next day, we drove to San Diego to visit our friends Tom and Jenny. Tom is from Karvina and used to be Zuzi’s roommate and Jenny is from Texas. They got married in Prague and moved to Austin, Texas. Now they decided to leave their two little kids with their grandparents and travel alone for the first time since they were born. We had breakfast at The Cottage, which was wildly popular. After the breakfast, we had drinks at La Veranda, notable for the fact that ALL the five bottles of beer brought to the table were past their best before date. Oh well. We left San Diego some six hours later and checked in the High Line hotel in Koreatown. We were tired and hungry, so ended up in Pot, Roy Choi’s restaurant downstairs. The biggest surprise of our LA stay. We did know Roy Choi as a chef and restaurateur but did not expect much from Pot. We ended up loving it. The place does not look like much and loudspeakers blast loud hip-hop so you have to raise your voice to talk. The custom-made tables include induction burners so that you can keep your pot hot, although we did not order them. We shared some starters, mostly fermented vegetables kimchi-style. The two standouts were the Uni rice bowl and the Shorty, a fragrant broth with lots of vegetables and chestnuts inside. It was our fist time to try uni and we loved the taste and the texture. The next morning we had breakfast at République, a fairly large place in Koreatown. We had the granola and a beautiful toast with soft-scrambled eggs, cooked ham and mushrooms and spinach on top. Delicious. They had a nice bar with freshly baked cookies and pies and the interiors were really nice, with a slight colonial Spanish twist. In general, we thought that the interiors of restaurants in LA were nicer than, let’s say, San Francisco. Then it was time for coffee. We had it at Coffee Commissary, a popular cafe on Fairfax. Saw lots of aspiring actors who bad-mouthed other aspiring actors and talked about protein shakes and exercise and what we thought were models and fashion types there. Nice outdoor seating. Liked the coffee and their barista was chatty and fun. By that time we had to visit an Apple Store because Jan managed to drop his phone on the concrete pavement, shattering his display to many pieces. But the replacement was only an hour wait and reasonably priced, so we were ok. On the way, we tried Ink.sack, Ink’s sandwich shop. Although the shop that features two tables in and outside is clearly popular, we were not impressed. We had the Banh Mi and Reuben sandwiches and both of them felt heavy and lacked freshness. It was a disappointment: we had high hopes but the place did not deliver. If you are in the area, you can skip this one. After an hour in the Grove mall waiting for the replacement glass, listening to Mariah Carey’s "All I Want for Christmas” (clearly the king and queen of any shop’s Christmas shopping playing) and watching people in shorts catching flakes of artificial snow, we had probably the best dinner in LA at Animal. Animal is a whole-animal restaurant located in a dimly lit room on Fairfax that is clearly very popular: they were full one hour after the opening time. We absolutely loved the food: we did have pig ears in a Chinese restaurant in Prague with our foodie friends and did not care for them. Animal’s version with a fried egg on top was absolutely fantastic: like eating crunchy bacon with an egg. Who can argue with that? Their pulled pork brioche-bun burgers with coleslaw just melted in your mouth. And their farotto with Katsuobushi had a great texture and a strong umami taste. The tres leches with dulce de leche, which we ordered as dessert, split opinions: while Zuzi thought it might have been the sweetest thing she has ever put in her mouth, Jan liked it. We did extend our stay in the High Line hotel for another night. We liked it a lot and had a third celebrity sighting of our stay when Jan shares his elevator with Lil’ Wayne, who had such a fun personality that Jan wanted to go along and walk into his Escalade but his security did not seem to like that idea. Anyway, we had tea and did our emails in the Commissary, another of Roy Choi’s eateries in the hotel, and then moved to Sqirl for breakfast. Having had the four-dollar sandwich at The Mill in San Franscisco, we had to try the LA version. The sandwich here was better than the Mill's: the slice of the brioche bread was thicker and the generous layers of almond butter and the blueberry jam just melted away. Finger-licking delicious. And totally filling. Worth every penny of the six dollars we paid for it. Then a quick stop to Eggslut again (we were dreaming of the egg sandwich every day since we had it, and we are dreaming of it still) with coffee at G&B Coffee, which is just a bar at the Grand Central Market that really runs Go Get’Em Tiger we mentioned previously, and then off to do some more shopping. We went back to Koreatown to have steamed buns at The Bun Shop. This was clearly a fast food version of, let’s say, the pork buns we had in Momofuku Ssam bar in NYC, but they were good for the price. We totally mismanaged our last day in LA: we wanted to visit the last places we had on our list but they were so far away we really ended up driving most of the day. Learn our lesson, kids. Plan ahead and it will pay off in LA. Really. We drove to Venice again and had coffee at Blue Bottle there. On top of that, we bought the Chemex coffee pot because it was so much cheaper in the US than in Prague. And it’s versatile and beautiful. Totally worth the extra carryon bag on our flights back home. From Venice, we drove for another hour back to where we were and had our last meal in LA at Son of a Gun, a sister restaurant of Animal with a focus on seafood. The restaurant was basically packed when we walked in and the staff was really nice to hold our reservation a bit longer because we got stuck in traffic. We had uni again, this time with burrata, and probably the best-prepared octopus we have ever had. Otherwise we liked Animal better. Son of a gun’s cooking seemed a bit simpler by comparison. After the meal we shopped for food at Whole Foods nearby because we were going to prepare a salad for the Thanksgiving dinner in Camarillo with Suzanne and Kevin and their family. We said bye to LA because we would then only see the airport. We spent the next day in Camarillo, shopping in the outlet centre because the pre-Thanksgiving traffic was supposed to be horrible, and the last day of our stay was Thanksgiving. The meal with the Springers was a touching experience. Suzanne and Kevin’s two daughters came by with their husbands and kids (five in total). We totally overdressed for the occasion and were happy to find that the whole event was much more casual than we thought it would be. The food was exactly what we expected: turkey, potato mash, gravy, cranberries, salad and apple and pumpkin pies. We were really thankful to spend the evening in the company of such a nice family. But then it was time to drive off and catch the overnight plane back to NYC. We always end our posts with a segment on shopping. Shopping in LA is very easy: they simply have everything. The array of shops available is just mind-blowing and whatever we have in Prague as a small selection somewhere in the corner of a multi-brand shop, they have in LA as a separate store, probably occupying a whole block with water fountains, balloons and 1000 square feet of empty space just because they can. For instance, the Marc Jacobs bookstore? Have you heard of it? Yeah, we did not, either. And it's awesome. Sunset Blvd around Intelligentsia Coffee has a number of lovely fashion and accessory shops for all income levels. Beverly Blvd also has a wide array of shops. Our most favorite: the Heath Ceramics shops that sells products of the San Francisco-based manufacturer and other assorted manufacturers of home ware and accessories. Added bonus: Rose Creamery with great salted caramel and rosemary ice-cream. Melrose Avenue. If you like fashion, your head will probably explode here. They have every store imaginable, and every store seems to occupy its own building, which is a big difference compared to NYC, where space is scarce and every store occupies its own… shoebox. Rodeo Drive. Richard Gere brought Julia Roberts to shop there. ’Nuff said. Abbot Kinney Blvd in Venice. Great designer shops for fashion and home accessories. Added bonus: Blue Bottle and Intelligentsia coffee distributed along the length of the street evenly.